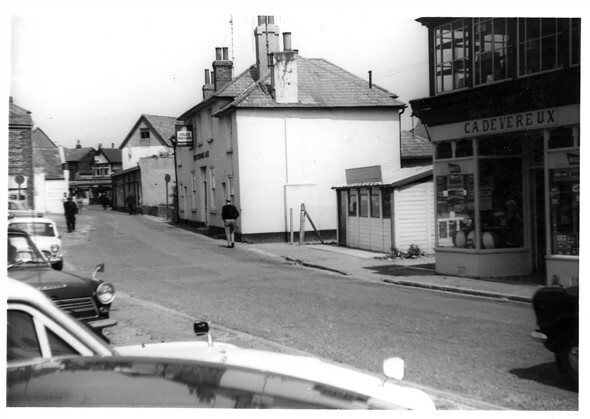 Chapel Street , the Jolly Sailor, right, in white, a Beer House only (now residences) Mini fresh fish shop and general stores near right. Woolgars Passage through to Bridge Street, now "Senlac" road. White building. Far, -last of Stone and Towners steam flour mill buildings, replaced by flats. This page was added by Tom Baker on 19/06/2007. Mr Sims the landlord of the Jolly Sailor was such a character, a lovely man, when my Finnish penfriend visited England for the first time in the 70's we took her there, among other pubs of course, and she still talks about it now ! They don't have pubs over there so it was a real novelty for her. I always thought it was like something out of Charles Dickens ! !, Mr Sims certainly didn't serve Babychams !!! Am I correct in saying that far left would have been the day centre, and a Doctor's clinic (before the one on Chapel Street was built)? They would have been behind Meeching Infants, which would have been immediately left on this picture. There was also a junk/antique shop on the corner of Chapel Street and Woolgar's Passage where my nan spotted a pair of 'Pattens' (wooden clog type over shoes, worn to keep your regular cloth shoes out of the mud in olden days). She balked at paying what she considered too much for them, so my dad, Len, nipped down there and got them. I remember having to remove them from the living room wall every time Nan paid a visit so she wouldn't get upset - families eh! Woolgar's passage came out next to the Crown Pub on Bridge Street. The Crown Pub was at the end of the twitten at the Bridge Street end and ran though to Chapel Street after passing though Sussex Place. Howells the Cobblers (not John or his son Mick) had a shop on the corner of Sussex Place/Chapel Street. Opposite was a sweetshop, I cannot recall the name, but I can remember buying awful ice lollys there, but they were only 1d! Rene`s the ladies hairdresser was on the Bridge Street/Woolgars Passage corner. And the Doctors Surgery was on a corner in St Lukes Lane. The mini fish shop was owned/run by my dad Malcolm Wood. Sometime in the late 60's onward. I spent many hours in there whilst he looked after me. My grandad also helped in the shop. In the allyway between the shop and the pub there was a concrete bollard which I remember clearly going round and round holding on with the top half with my arm and wearing a huge hole in the underside of the sleeve of very new duffle coat. Can't remember the outcome though ! Hi, great site! in the picture of the Jolly Sailor, the gap between the fish hut and Deveroux grocers shop led into the work shop of C.R.Irving & co (engineers). They were situated in the ground floor of the old bakery. Above was the workshop of Bob Lower (carpenter & joiner ) in the yard area C.R. Irving fabricated the caisson for the Royal Sovereign light tower prior to transporting it to Tidemills. The area regularly flooded. it was compulsivly purchased for the construction of the swimming pool and the supermarket. Irvings relocated to the e-plan estate, New Road. Cowley's bakery was located in the old bakery prior to it being CR Irving. Vernon & Joan Cowley owned the bakery 1954 for approx. 10 years, they also owned a bakery in Railway Road, Newhaven.